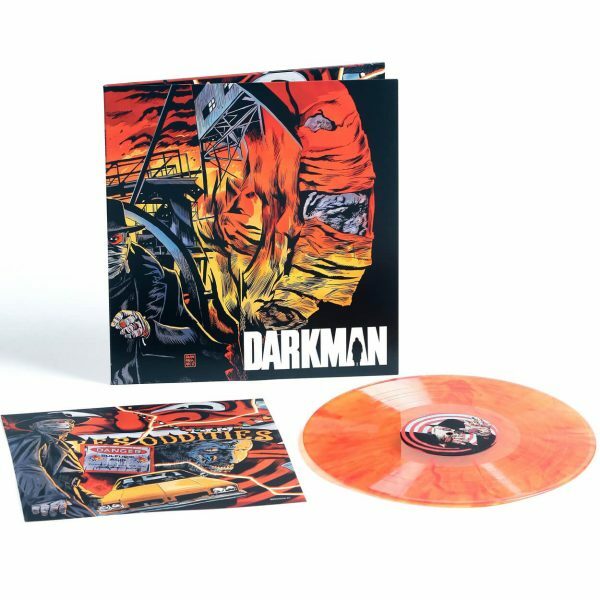 Waxwork Records is proud to present the deluxe vinyl re-issue of DARKMAN Original Motion Picture Score. Directed by Sam Raimi (Evil Dead, Evil Dead 2, Army Of Darkness) and starring Liam Neeson, DARKMAN is a 1990 dark superhero film that pays homage to classic Universal horror films from the 1930’s and 40’s. The film follows a scientist that is attacked, burned alive, and left for dead by ruthless mobsters, who then returns to seek revenge on the men that made him what he is. Unable to acquire the rights to Batman or The Shadow, Director Sam Raimi decided to create his own, original character, drawing inspiration from The Phantom Of The Opera and other classic horror monsters. A hideous and disfigured non-superpowered man that fights crime, but he is also an unfortunate victim to a tragic love story as a creature that desires, but ultimately cannot have his love interest. The score by composer Danny Elfman mixes classic orchestral compositions and unsettling carnival music. Waxwork Records has re-mastered the full DARKMAN score for vinyl, and packaging details include 180 gram “Fire” vinyl (Fluorescent Orange and Red Swirl vinyl), housed in an old-style tip-on gatefold jacket with satin coating, all new artwork by award winning and acclaimed illustrator Francesco Francavilla, and a 12”x12” art print.